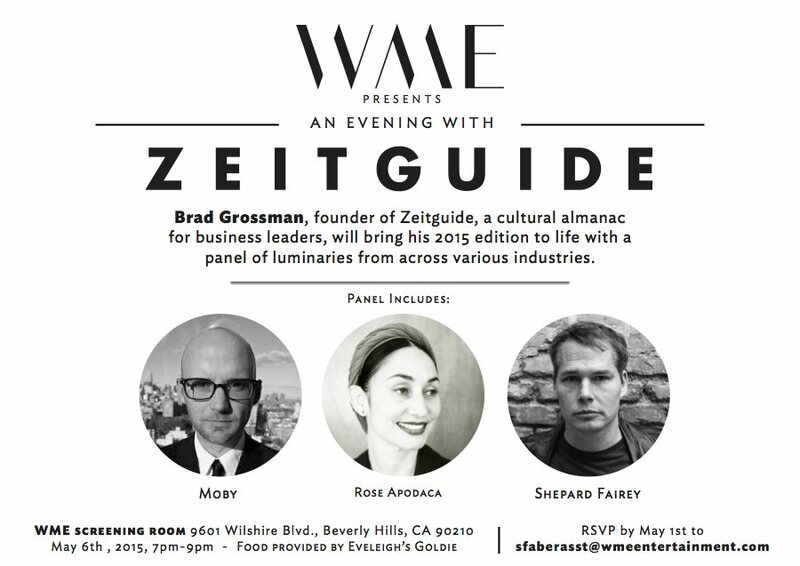 I hope you will take the time this Wednesday, May 6, from 7-9 p.m. to join Moby, Shepard Fairey and yours truly in a panel helmed by our friend Brad Grossman, who’s taken the uber inquisitiveness that made him Brian Grazer’s right hand guide for so many years and in 2008 finally founded the Zeitguide, a multi-media platform that guides a wide swath of industry leaders through leading-edge issues in our constantly changing culture. This is the 2nd in the Zeitguide’s west coast talks, which premiered this year, and it’s taking place at the William Morris Endeavor HQ in Beverly Hills. There will be wine and bites provided by Eveleigh Goldie, and valet parking available. The event is in the WME screening room at 9601 Wilshire Blvd. in Beverly Hills and starts promptly at 7.